The harmonica has earned its position as one of the highly valued wind instruments we know in the music world today. It is a mouth organ that can be described as having a simple look until it is played. The harmonica was invented in the nineteenth century; it is also called the French harp. There are different types of harmonicas; we have the Richter harmonicas, Chromatic and the Tremolo harmonicas among other brands. The main factor used to distinguish the harmonicas is the number of holes in the musical instrument. For example, some harmonicas have ten or as many as sixteen holes. The harmonica is also one of the most adaptable musical instruments. It can be used to play songs in different music genres. 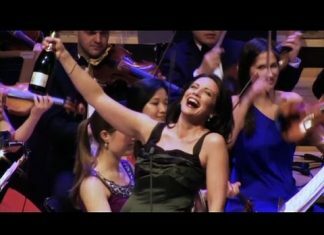 This is a feature that has made the musical instrument even more popular in public. What are the Best Harmonica Lessons for Beginners? 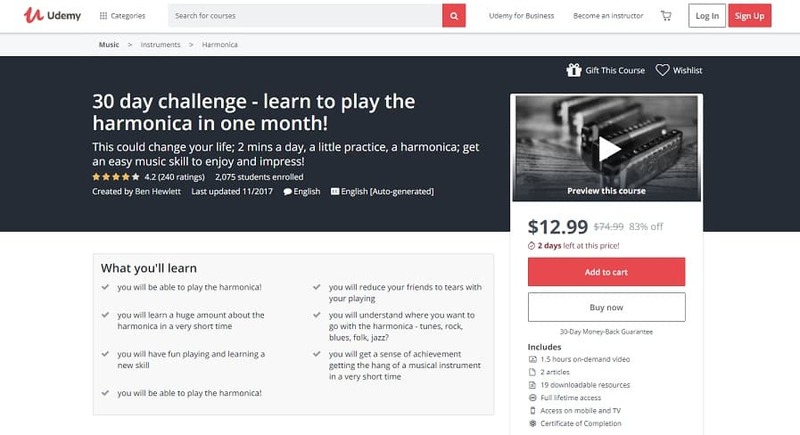 3) Udemy: 30 day challenge - learn to play the harmonica in one month! There are many options to learn﻿﻿ how to play the harmonica. Anyone interested in learning the harmonica techniques can find convenient online harmonica lessons for beginners. These lessons have been created by professional harmonica players who have also earned a reputation as music teachers. The curriculum is however varied to meet the different needs of students who take the courses as beginners. There are so many reasons to learn the different techniques of playing harmonicas. It is such a small musical instrument so you can carry the harmonica around easily. This also means you will find it easy to learn and practice the different techniques. The harmonica will be helpful to new musicians who want to add an exciting touch to their sounds. Thankfully, it is easy to select the harmonica as your principal instrument because of its versatility in the music scene. People who aspire to become professional harmonica players can start learning immediately by taking any of the harmonica courses for beginners. The courses are also suitable for others who want to learn how to play harmonicas for fun. The harmonica courses for beginners you will find online start from the basics, and they are suitable for young children and older students. The following harmonica courses offer learning opportunities for everyone interested in the musical instrument. This harmonica course for beginners includes learning materials which feature video lessons and a wide collection of backtracks to help students quickly master the needed techniques. The lessons students will take are developed to help them form a good foundation as harmonica players. For example, students are first introduced to the harmonica and taught how it functions to produce sounds. Students also take lessons which cover areas such as how to hold the harmonica and tips on playing the musical instrument from different positions. The music theory aspect of this course covers areas such as learning about the scales, notes and how to develop embouchure. Other lessons focus on practical exercises during which students get a chance to learn how to apply the scales, and participate in breathing exercises. Overall, the lessons help students to understand how the harmonica can be played, and they have a chance to practice with different backtracks which have been added to the course. 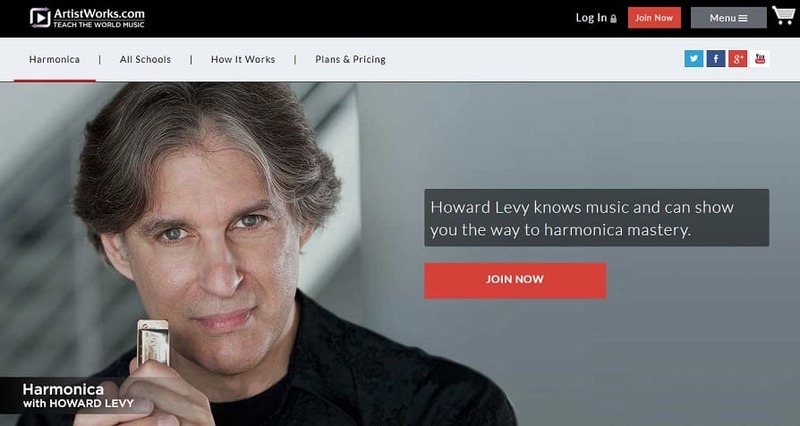 This harmonica lessons for beginners has been prepared by Howard Levy, a music teacher for over forty years; he has made multiple recordings with reputable musicians from all over the world. Howard is a trusted music teacher whose experience covers teaching students how to play harmonicas to Jazz, Latin, and classical music among others. Everyone interested in learning professional harmonica skills to impress their friends will find this course for beginners a good match. The lessons in this program have been simplified for both young and old students. This course also covers harmonica techniques for different music genres, so it is easy to acquire the needed skills during the course. Students taking this course will learn how to use the right tonguing methods to produce tunes while playing the musical instrument. The lessons also cover areas such as music theory which include learning about the chords, scales, and rhythms. In the section for exercises, the participant in this harmonica course for beginners get the first opportunity to blow into the musical instrument. 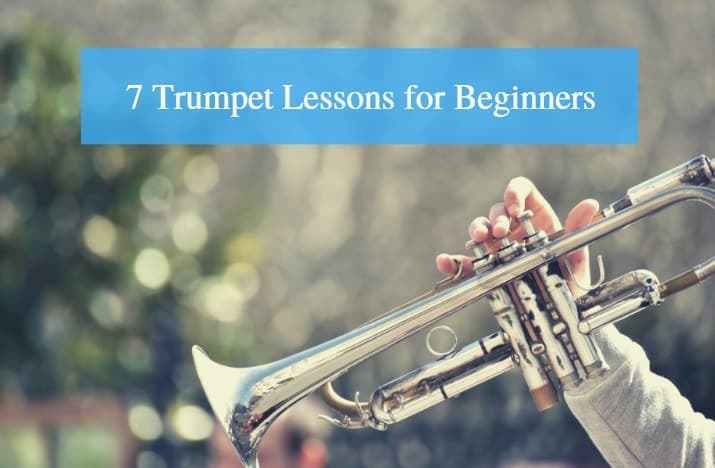 To get started, students participate in breathing exercises, and how to apply concepts such as chugging, different tonguing techniques, and bending notes. At the end of this course, students are expected to understand the basic principles needed to play simple tunes with the harmonica. The practice sessions help students test their techniques and improvisation skills. This course is presented as video lessons which have been created by Ben Hewlett. He is a music teacher who has been helping amateurs improve their skills with the harmonica for over twenty years. Ben has adopted creative methods which are flexible and help students get value from the lessons. The curriculum used for this harmonica lessons has been created to help beginners learn how to play the musical instrument in thirty days. The lessons have features that help students study and learn from the music teacher and have a few minutes daily for practice. After the foundational lessons, students can start applying their knowledge and playing tunes with the harmonica. 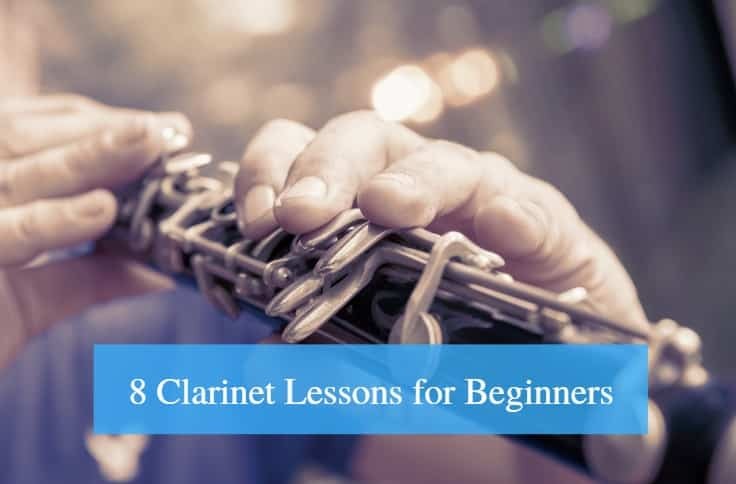 The video lessons cover areas such as learning about the notes and how to bend them while playing tunes, applying the necessary scales, and understanding the role of harmony while playing the harmonica. The lessons are quite versatile since they teach students how to play songs in music genres such as Jazz, rock, blues, and others. In total, this course presents thirty-five lectures which are spread across a period of one month. The music teacher in charge of this course is Ben Hewlett; he is a professional harmonica player who has compiled his extensive knowledge as a complete one month course for all students. At the end of this course, every participant will be able to play simple tunes with the harmonica and have the basic knowledge needed to proceed to take advanced harmonica lessons. 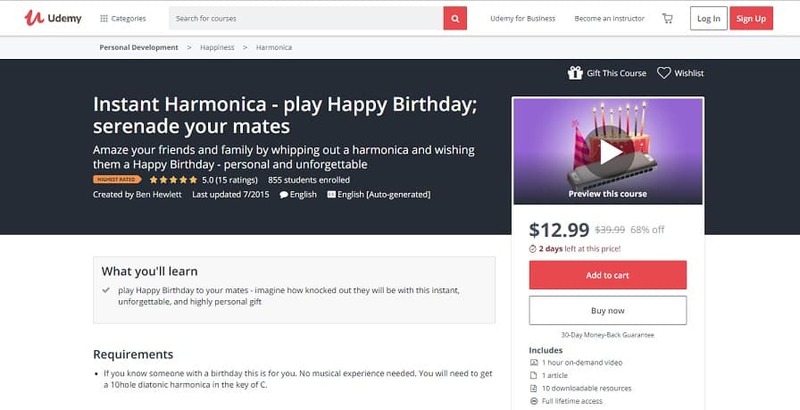 This is a special course created to teach students how to play the harmonica while serenading celebrants during birthday parties. This course is suitable for young children who will like to surprise their parents and everyone who can use these harmonica skills to impress friends. The focus of this course is simply learning how to play “Happy Birthday” tunes during the happy celebration. However, students are taught the basics regarding playing harmonicas. This includes learning about the notes, scales, the chords, and the appropriate octaves that need to be applied to get the tunes right. To take this course, participants are not expected to have prior knowledge of how to play the harmonica. During this harmonica course for beginners, the lessons have been structured to cover each line of the tune. In total there are twelve lectures which last for about ten minutes or less. Students proceed by learning the first line of the tune and practicing before proceeding to learn the second and third line. After mastering the lines of the birthday song, there are simple exercises as well as tips to help each student apply their techniques and overcome simple mistakes. This course was created by Ben Hewlett. He is a music teacher whose career as a professional harmonica player spans over twenty years. Ben confirms that it has been a pleasure to teach students this unique harmonica technique to help them put a smile on the faces of their friends and family. Students searching for a short course that covers the foundational lessons for the harmonica will be interested in this course. It is for beginners who may have never played the harmonica before. According to the curriculum, students can learn how to play the harmonica in only seven days. 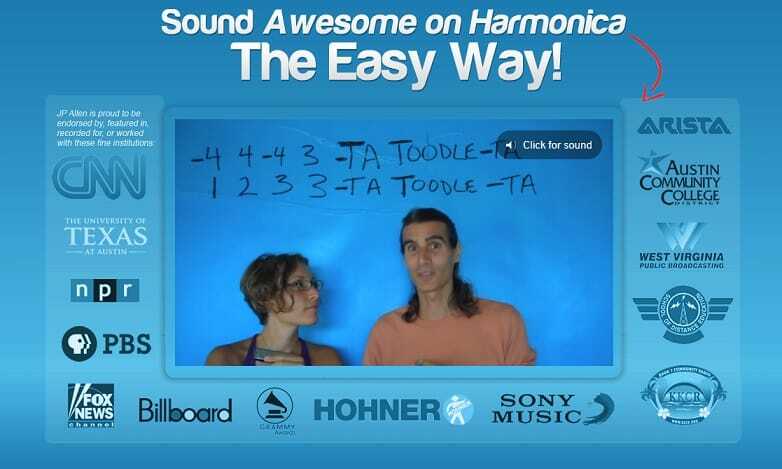 The course, which features video lessons, teaches students the basics about the harmonica. There are lessons that cover techniques such as holding the harmonica, how to master the correct breathing pattern while playing tunes, and understanding the concept of chugging. 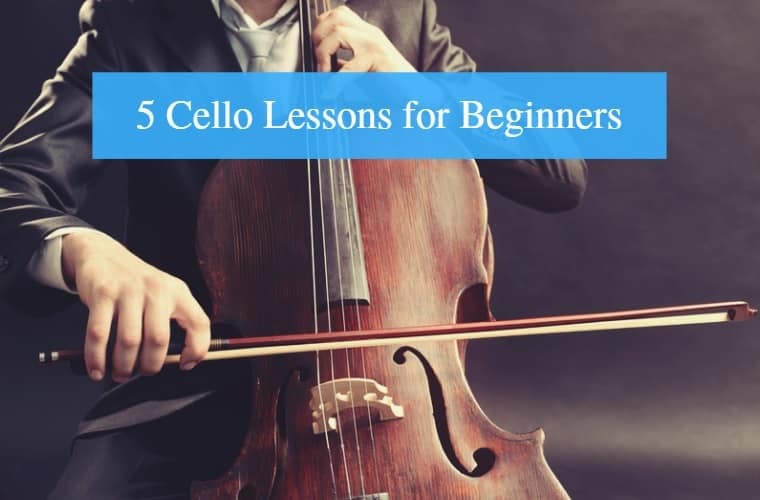 The next lessons cover areas such as playing the first notes and learning the process of bending notes and how to apply the scales while playing tunes. 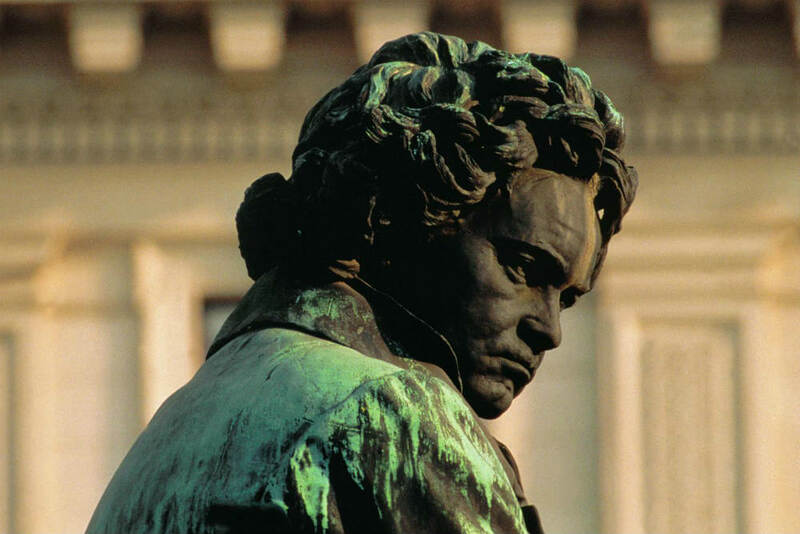 As beginners, students are only introduced to the techniques needed to play single notes during this course. Each video lesson lasts for about five minutes, and they can be taken at the convenience of the student. This course has been arranged by Ben Hewlett. He has composed the lectures using an approach that simplifies the harmonica techniques to make it easy for students to master and start playing tunes in seven days. The focus of this harmonica course for beginners is to teach students how to play at least five rock songs with the musical instrument. It is a targeted course for a specific audience who need to achieve their dream of playing favorite rock songs. The rock artistes whose songs are featured in this course include the Beatles, Bob Dylan, The Rolling Stones, Leonard Cohen, and Ben E. King. 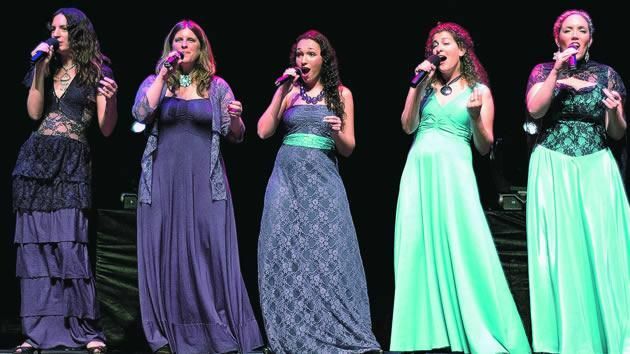 The entire program is presented as thirty-four lectures which feature a step by step approach to teaching students how to create the right tunes for the different songs. First, students are introduced to the musical instruments. As beginners, students undergo fun lessons to teach them the right holding position and breathing patterns while playing the harmonica. Students are also introduced to the foundational lessons that will help them start playing single notes. Next, the exercises cover tips on how to play the rock songs and students can start practicing. The music teacher who organized this harmonica course for beginners is named Cooper. In addition to teaching music, Cooper has also created music blogs to teach and enlighten the public about music and how to play harmonicas. This course highlights core areas for beginners to help them avoid common mistakes while learning how to play the harmonica. 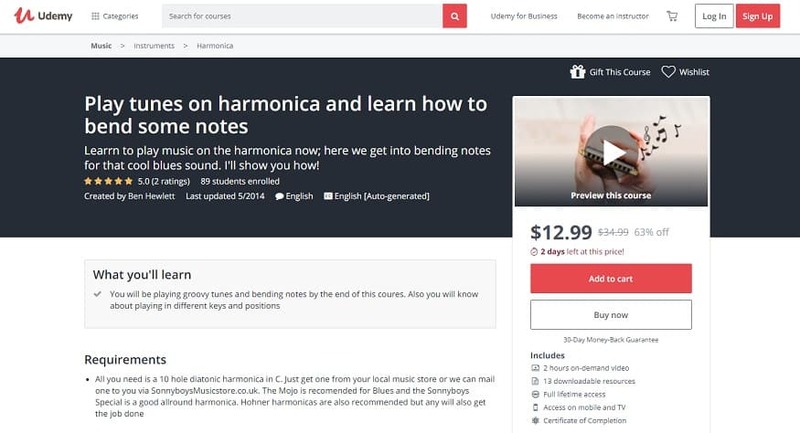 In this course, a simple approach has been adopted to help students learn and master the basics of playing harmonicas. The focus on this course is to help students understand the harmonica notes and how they influence the tunes played. The lessons feature simple exercises that make it easy for young and older beginners to quickly understand the concept and start playing tunes with the harmonica while using the right notes. 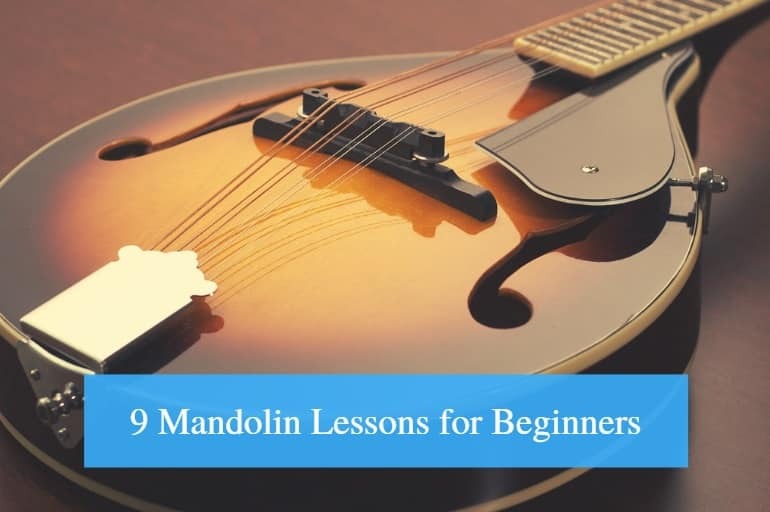 Some areas covered in this course include an introduction to the single notes, and tonguing notes for beginners. Students also learn about the different box patterns, and they get an opportunity to practice and apply the groovy scale while playing harmonicas. There are special lectures which focus on helping students develop embouchure and improve their improvisation techniques. The course also features bonus lessons which teach students how to play advanced tunes after learning the basics. These lessons have been created by a professional harmonica player named Ben Hewlett. His teaching approach incorporated fun and simple method of explaining the different lessons to make comprehension easy. The course features only fifteen lectures which can be taken at the student’s convenience. Everyone who has been searching for a foundational harmonica course that is focused on teaching students how to bend notes will find this course helpful. The lessons in this learning program for beginners who want to become professional harmonica players are focused on bending notes. The music teacher has put together a series of lectures to help students understand the concept of notes regarding playing harmonicas. 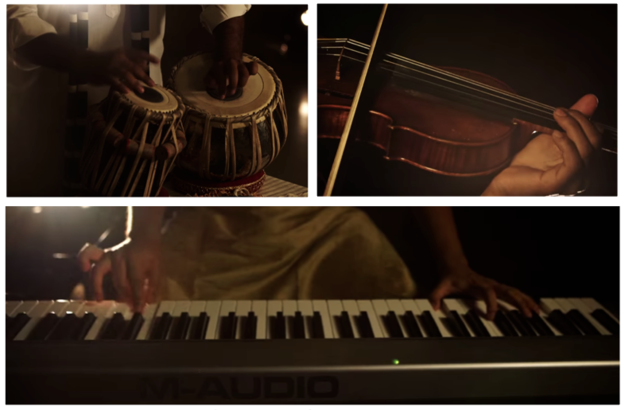 Also, they are taught how to play the musical instrument from different positions. In total, students will be introduced to the twelve positions from which the harmonica can be played. The main feature of this course which is the bending notes technique is covered in four lectures. The participants in this course are taught about the different holes in the musical instrument and how they influence bending notes. 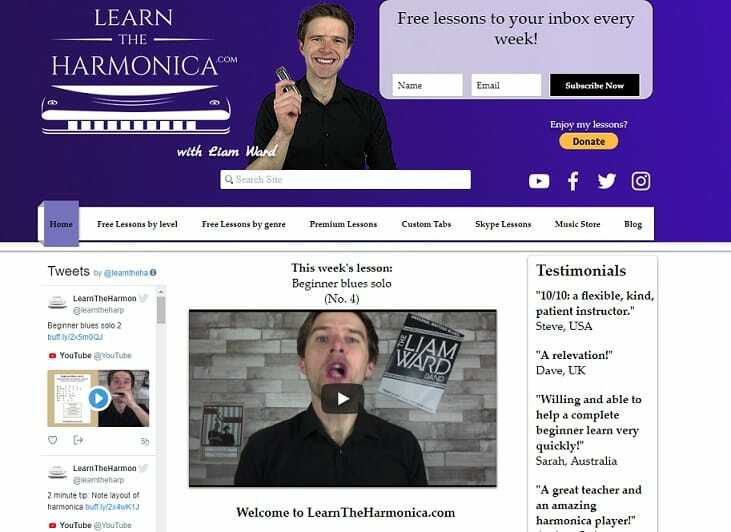 The lessons in this harmonica course for beginners are presented as instructional videos which feature the music teacher explaining and demonstrating the techniques. At the end of this course, students are expected to have more confidence regarding creating the right tunes while bending notes and improvisation with the harmonica. This course is presented by Ben Hewlett, a professional harmonica player. 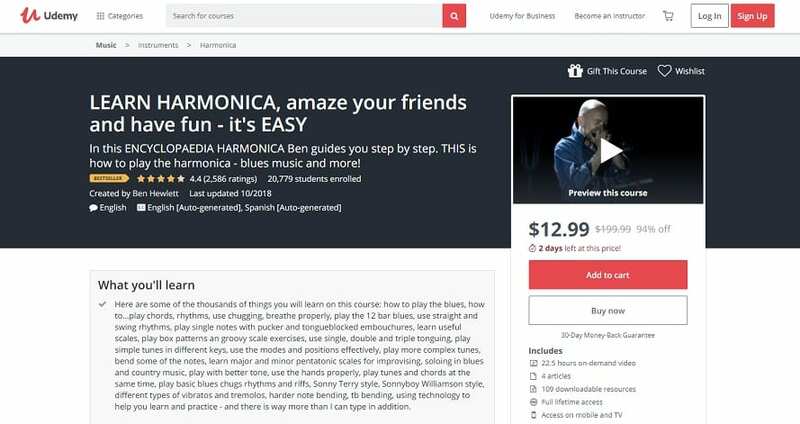 He has created this training program to help beginners overcome a particular area of playing the harmonica which could otherwise be quite a problem. Through this course, students will understand how to avoid simple errors and improve their techniques. Students who take this course have a chance of learning four essential aspects regarding playing harmonicas. The lessons have been created as video files which last for a total period of forty-five hours. This is a course for students who need to take a step by step approach while learning how to play the harmonica. Students taking this course have an option to participate in live lessons, or private lessons to learn more about the harmonica. The four areas covered in this course are as follows; an introduction to the single notes and how to use the musical instrument accordingly, the right methods of holding the harmonica, understanding the logic behind breathing patterns while playing tunes and learning how to bend notes. Students are also introduced to the music theory related to the harmonica. There are tips on how to understand the scales, rhythm, and the common terminology associated with playing harmonicas. The lessons teach students the basics about playing harmonicas to different genres of music. For example, at the end of this course, students will be able to play Jazz, blues, and rock songs, among others with the harmonica. 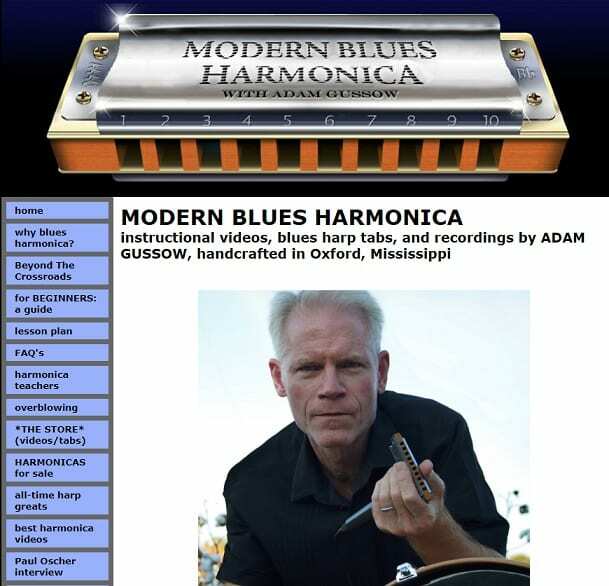 The lessons presented in this harmonica course for beginners have been compiled by a group of music teachers and professional harmonica players. The program offered in this harmonica course for beginners gives students the opportunity to take free lessons first before signing up for the other parts of the course. Students who take this course are given an opportunity to browse through hundreds of free learning materials during the program. There are free tips and hints which have been organized and presented based on the songs which are arranged based on the different music genres. After the free lessons, students who find the experience valuable can proceed to register for private lessons. These lessons are organized via Skype. Before participating in this course, students are encouraged to have a harmonica and a computer with internet access. During the course, students are taught different aspects related to music theory such as how to apply the notes, scales, and the different positions for playing harmonicas. There are also tips on how to use the octaves; students also get a chance to practice their first tunes which can be songs from any of the genres covered in the program. The music teacher in charge of this program is named Liam Ward. He is a reputable music teacher whose expertise with the harmonica has earned him notable awards. 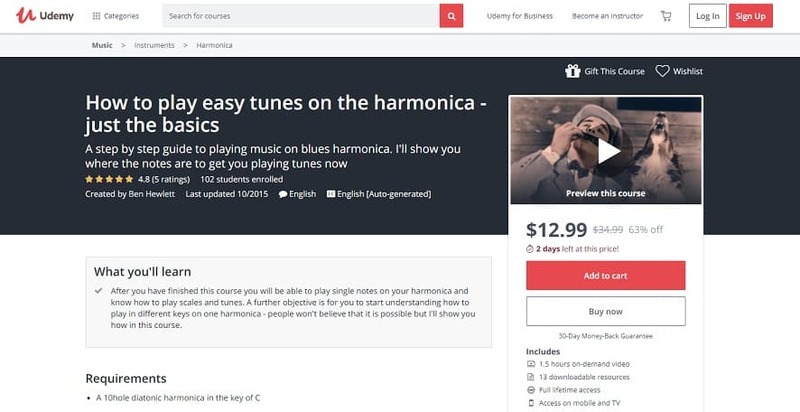 The approach used in creating this course was mainly about helping everyone who wants to learn how to play the harmonica to achieve their dreams easily. The lessons have been made simple, following a straight forward process that ensures all students start and complete the course. The lessons are available to students three times a week. They last for about ten minutes, during this time; students are taken through the basics of playing harmonicas. 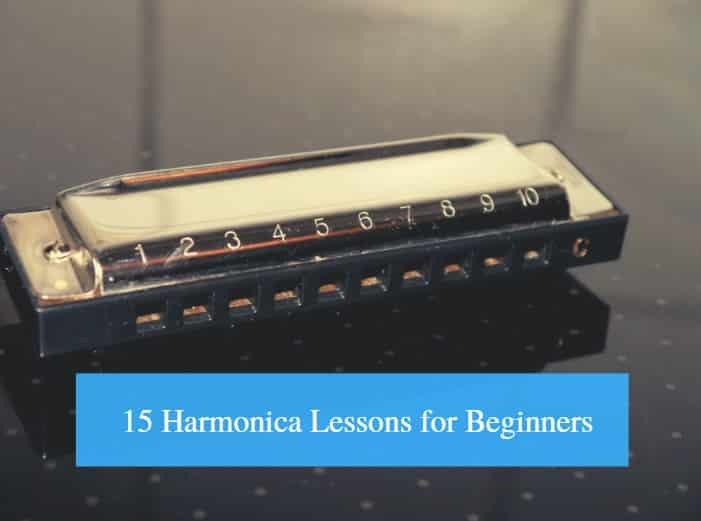 These lessons cover essential areas such as learning the notes and scales, understanding the different playing positions, learning about the tonguing methods, as well as the common terminology every harmonica player should know. The lessons in this course are based on the C-key. Students are offered the video lessons which they can study and practice after understanding the concepts being explained by the music teacher. The program follows a step by step approach which makes it easier for everyone to participate and learn successfully, even if they have never played the harmonica before. Students who participate in this course will also have an opportunity to play along with the instructors who demonstrate the right techniques in the videos. There are also dozens of tips to help new learners understand how to get the single notes right during the course. The lessons in this harmonica course for beginners have been created by JP Allen; he is a professional harmonica player and music teacher. His passion for teaching led to the creation of this online course for all students. Students who have been searching for harmonica lessons for blues music can check this course out. The lessons in this course are quite extensive; they cover areas such as teaching students about the harmonica its parts and the different brands in the market. Students are given tips which can help them make better buying decisions when shopping for harmonicas. Also, students who have discovered a passion for the blues songs played with harmonicas will get an opportunity to understand the right playing positions from which the tunes are produced. The lessons also cover special tonguing methods which are essential to getting the tunes right when practicing with the harmonica. The lessons in this course have been structured for young children and older students. There are follow up exercises at the end of each lesson. These exercises give students an opportunity to practice and become better harmonica players. During the course, students have an opportunity to communicate directly with the instructors to get clarifications and further assistance during practice. The lessons are presented as video files which are of high quality. There are also tips and ideas that can help students further develop their embouchure. This online course for beginners offers students a chance to learn and master correct harmonica skills from an expert who has been playing the musical instrument and teaching others for about thirty years. This harmonica course will be essential for students who are focused on learning more about the diatonic or the chromatic harmonica brands. The video lessons for this course have been premade. However, students have an opportunity to experience twelve live lessons specially scheduled by the music teacher. Students who have never played the harmonica before can take this course and learn all about the musical instrument. 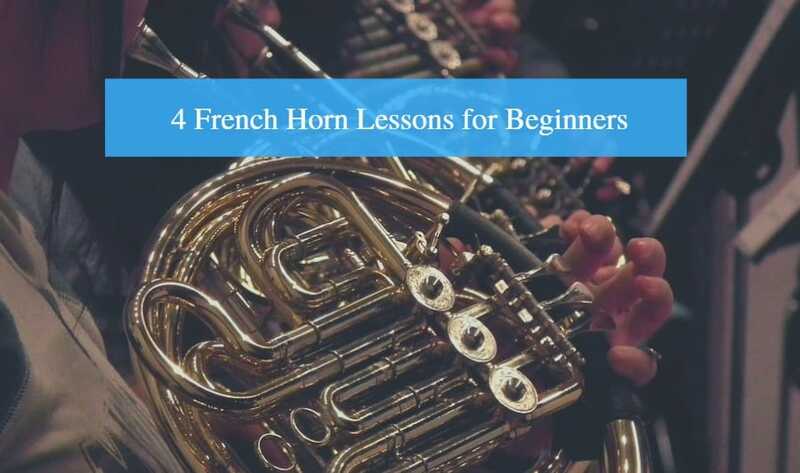 The first lessons cover foundational areas such as teaching students about the holding positions and how to play the instrument. 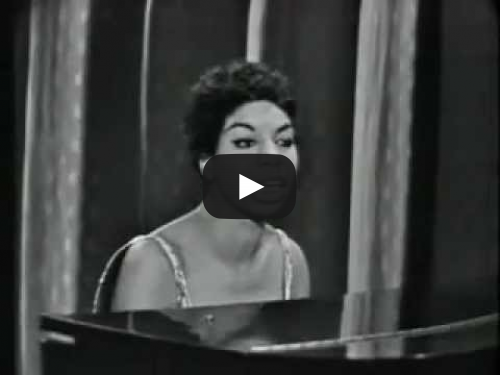 Participants in this course are also taught about the chords and notes; these lessons cover the techniques which can be applied to the diatonic and chromatic harmonicas. After the basics, students are taught about the techniques to play harmonicas from the first and second position to get the right tunes for blues songs. During the course, students have access to hundreds of tips which cover breathing patterns, bending notes, and switching chords. 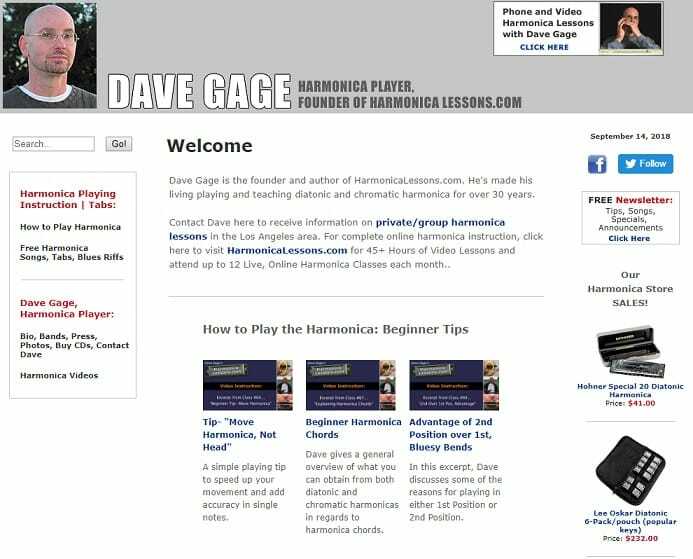 These lessons have been created by David Gage; he is a professional harmonica player who has been teaching students for about thirty years. David successfully transfers his excitement and passion for the harmonica to his students through the lessons which are interactive and easy to understand. To get started with this beginners course students are offered a chance to take the free harmonica lessons. These are introductory lessons which help students understand the goals to be achieved during the course. After the introductory lessons, students can start the beginner’s lessons. At this stage, students are taught about the chords, how to read music, the notes, and an introduction to the basic methods of playing harmonicas to songs in different music genres. The lessons in this harmonica course for beginners are suitable for children and older students. The music teacher has added animated videos and interactive features to make the learning experience fun and easy for all participants. This is a good course for students who are in search of free learning materials related to professionally playing the harmonica. Each video lesson features the music instructors demonstrating and explaining the different basic concepts to the students. At the end of this course, each participant should have an idea of how to apply the tonguing methods, and play harmonicas from different positions. They should also be able to play simple songs without making mistakes. In this online academy, students can participate in the complete beginner’s course to master the right harmonica techniques. This course is for people who are interested in learning how to play the harmonica from scratch. The basic lessons cover music theory, practical exercises and there are many tips to help students understand and remember the lessons. After an introductory lesson, students are taught music theory which includes how to read sheet music, understanding concepts such as rhythm, the chords, switching pitch, and bending notes. 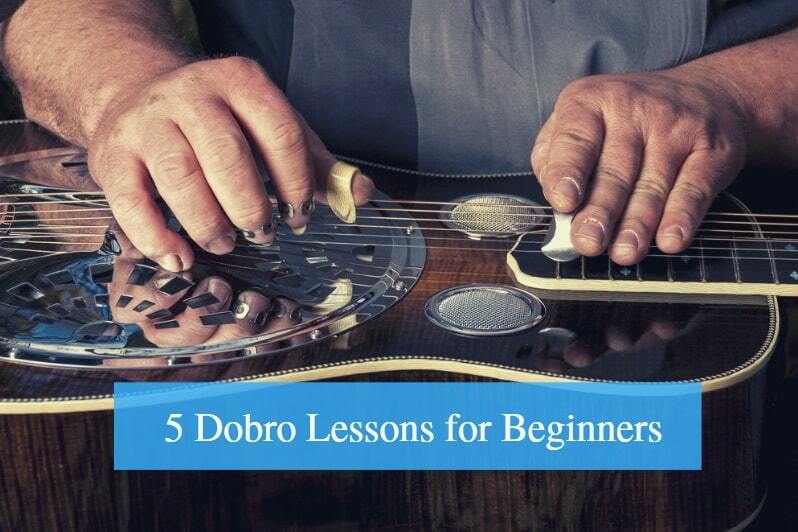 There are also lessons that cover the basic terminology beginners should know while learning how to play the harmonica. The complete harmonica course for beginners features short lessons which make it easy for students to plan their schedules to attend all the courses conveniently. During the practical exercises, students are not limited to a particular music genre while practicing the songs. There is a vast library of backtracks available to all students who take this course. 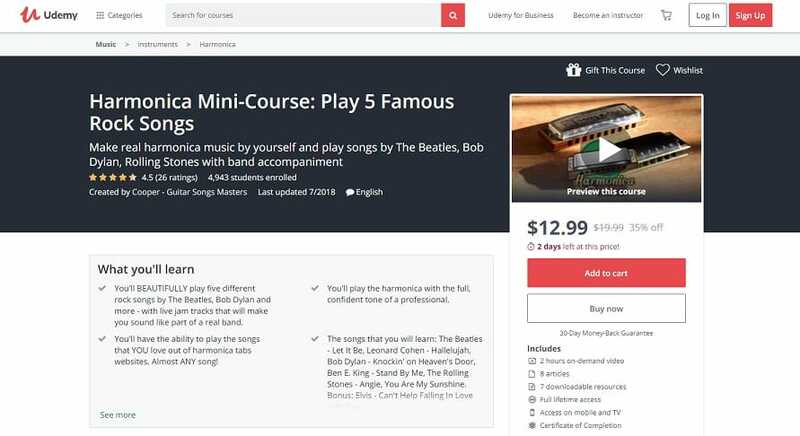 Also, students can take advantage of the special section of easy tunes which can help improve learning and encourage students to practice more during the course. 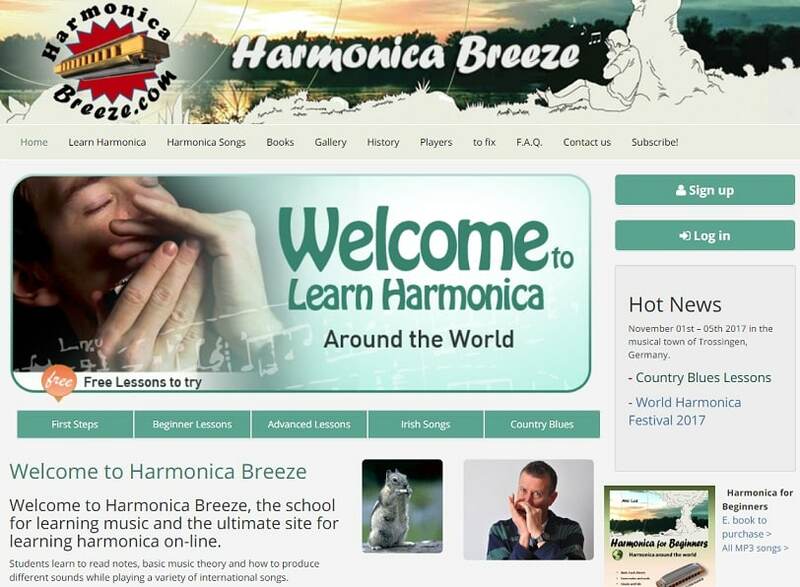 Some online harmonica course for beginners feature lessons which have been arranged in a curriculum that make it easy for students to move from one lessons to the next easily. This helps students understand the different concepts before proceeding and get more values during the course. It is a good idea to read the course description to know if the music teacher has followed this process. Also, the best online courses feature high-quality videos which have good audio. This means you won’t have any issues studying the video lessons. You can check free videos if they have been offered to view the quality or read past reviews. It is also important to note that some courses offer a comprehensive beginners course while others are focused on particular areas. Students who plan to proceed to learn advanced harmonica courses after completing the course for beginners should consider registering for the complete harmonica course for beginners. 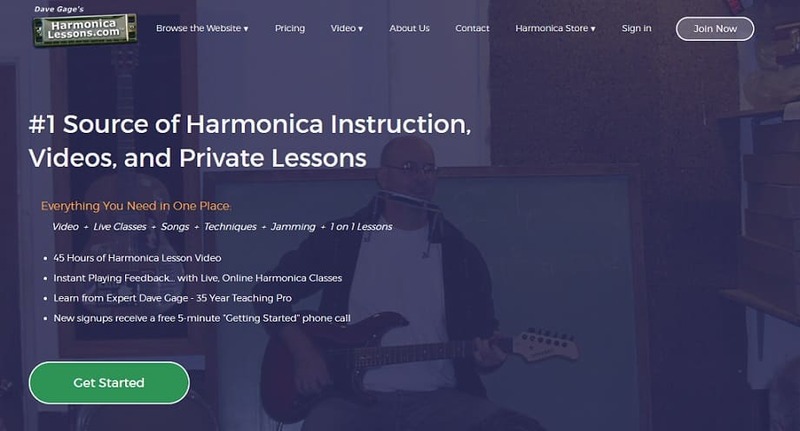 If you are interested in learning for fun, you can find harmonica lessons online that cover the particular areas of your interest. Overall, it helps to choose online harmonica courses that feature a structured plan to help students practice more often.